Every two months, usually on a Friday, nine individuals around the planet ready themselves for a strange ceremonial. In Australia, in the afternoon, the first of the nine opens a beer looking forward to dial a non-descript number in France. In Kyoto, the second one rushes out of a classroom back to his office to call the same number in France. In Paris, Padova, Tours, Saarbrucken and Lisboa, they are all savouring their first coffees of the day, as the eighth one in California is desperately trying to stay awake in the middle of the night, wondering if the call is on Friday or Thursday night, his time. The ninth one is in an airport somewhere around the world trying to get is latest portable gizmo from Apple to connect so he can dial this damned number in France. No these people are not the member of the Spectre organisation (the nemesis of 007) nor the member of another conspiracy oriented secret society; these are the members of the board of the International Sol Gel Society who despite distances meet at least every two months by dialling a strange number in France. Well we are all, scientists, all, passionate about sol-gel science and technology. We come from various scientific and geographical backgrounds, both from academia and industry. We are all volunteers, paying members of the society, who are giving up some of our free time to promote sol-gel technology and help run the society. 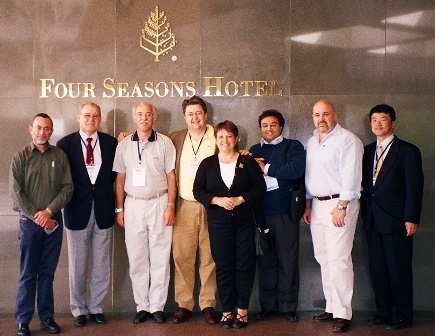 We are elected every two years at the ISGS Sol-Gel conference. For the next four years, under the guidance of the Chairman of the board David Avnir, the board gradually build up the society from ground zero. Michel Prassas set-up a fully functional and interactive website for the society. Michel Aegerter organised and codified the various awards in addition to helping, with the other Michel, formally cement the link between the ISGS and the JSST. Eric Bescher did set-up the legal status of the society as a not for profit organisation and took care of the treasury. Gunnar Westin designed from scratch a transparent procedure for the selection of candidates for the organisation of the sol-gel workshop. Hiro, Plinio and Chris ran a myriad of small projects from the selection of candidates for awards, proposal of candidate for the editorial board of the JSST, organising workshops etc…Florence, as the president, was on all front. 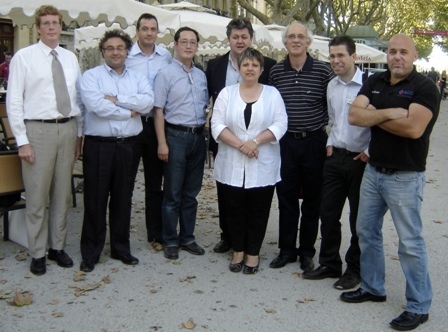 In 2007, we organised the first ISGS one-day pre-conference workshop in Montpellier, which was a frank success with more than 70 attendees from both industry and academia. In Montpellier, David Avnir, Hiromitsu Kozuka and Michael Aegerter were replaced by Philippe Belleville (France), Guido Kickelbick (Germany) and Kazuki Nakanishi (Japan) duly elected out of 6 new candidates. In 2008, the first ISGS summer school was organised by Plinio Innocenzi in Alghero Sardinia and in early 2009, the board recruited Armelle Guilloux, to take care of the administration on a part time basis. This was the first step towards a more professional organisation. In Brazil, Plinio Innocenzi, Gunnar Westin and Michel Prassas were replaced by Rui Almeida (Portugal), Geraud Dubois (USA) and Massimo Guglielmi (Italy). Brazil saw also the second ISGS preconference workshop on hybrid materials as well as the creation of some travel awards for students to attend the sol-gel conference. Sara A. Bilmes, Vadim Kessler, Michel Wong-Chi-Man and Jean-Marie Nedelec replaced Florence Babonneau, Christophe Barbé, Eric Bescher and Guido Kickelbick. Géraud Dubois was designated as President. In October 2012, Elisa Campazzi, who was in a position to be elected in the last election has accepted to replace Philippe Belleville. Andrei Jitianu (Lehman College – City University of New-York, USA) and Masahide Takahashi (Osaka Prefecture University, Japan) were elected. One to replace Kazuki Nakanishi, one to increase the staff. Prof./Dr. Jean-Marie NEDELEC (ENSCCF-Clermont Université, France) has been designated as the new ISGS President, replacing Géraud DUBOIS who did an excellent job to manage and lead the Board for 2 years. So, a great thank you to all the former members of the ISGS board for their ground breaking work and here we are, the nine servants of the sol-gel, at your service, to make this society a dynamic place to educate, promote and exchange ideas about sol-gel science and technology.